In 1966 the art scene in Flanders was surprised to discover new work of an unknown young Dutch painter from Roermond at “Trefpunt” in Ghent which at the time was the Mecca of the Flemish art movement. His name? Hans Kitslaar. The young man from Roermond received his training at the Maastricht Art Academy and completed his education at the National Superior Institute for the Arts in Antwerp, where Rik Slabbinck was his teacher and mentor. Already in his early twenties he received important awards for his work, but it remained to be seen whether this would convince the Ghent art community which at the time was mainly appreciative of the more established artists of this era. Walter De Buck though had a good intuition with regard to the future of the young artist from Roermond and introduced him swiftly in the Ghent art scene, in which he easily integrated and where he received all credits from the then renowned and leading art gallery “Salons Vyncke-Van Eyck”. In 1967 Hans Kitslaar arrived in Deurle on the Leie river where mayor and patron of the arts Antoon de Pesseroey recognized the potential of the young artist and introduced him to the artist Maurice Schelck, who a couple of years before had started a small But characterful and highly frequented gallery with the name “Deurlica”. This was the start of a growing interest in the work of Kitslaar from a flourishing art scene which attracted a lot of artists and art lovers and art collectors and critics and which got a lot of attention from and coverage by the media which competed in delivering well documented reviews and critics in cultural magazines and papers. Kitslaar became friends with artists such as the painters Fons Roggeman, Joe van Rossem, Benny van Groeninge and Henri Vandermoere, as well as with the poet and art director Berten De Bels and the sculptor Herman Van Nazareth. In the Leie region, Fons Roggeman, Henri Vandermoere and Hans Kitslaar became to be known as ‘the painters of the light’. It was a small step now to move into the Sint-Martens-Latem art scene. Art critic Jan D’Haese, a man with a reputation for discovering and promoting promising talent, introduced Kitslaar into ‘De Latemse Galerij’ which was an art room annexed to ‘De Klokkeput’ which was the artistic meeting centre of the Latem artists’ village. Prominent painters such as Miel and Frans De Cauter were the leading artists in this community and the elite of artistic Flanders gathered around this platform. Kitslaar’s presence and the appreciation he earned in this centre of artistic creation in Flanders opened the path to a successful career. Ten years later, Hans Kitslaar was considered to be a most important newcomer in the Belgian art scene. He obtained this position thanks to his unique talent and style which combines romance and lyricism and poetry through the use of a mild and gentle and luminant touch. In only one decade he became a trendsetting artist of the Low Countries. After restless years of moving to various villages in the countryside together with theatre actress and his wife at that time Suzanne Juchtmans and their children Eric and Yuri, Kitslaar finally settled with his new life partner Anne-Marie Van Pachterbeke in a trendy loft in the Ghent area known as Patershol. After a number of years Hans Kitslaar married Anne-Marie Van Pachterbeke and together they finally decided to respond again to the call of the quiet and rural environment around Ghent and finally they settled in an old farm which they transformed into a quiet oasis with a small ‘garden of Eden’ in the village of Lochristi. Anne-Marie’s subtly and meticulously designed garden became a creative refuge for the artist and a new source of inspiration for a wide variation of his flower paintings. Their house and the studio and garden in Lochristi each year transform into an exhibition space for the paintings and pastels of Hans Kitslaar and for the work of artistically related sculptors and colleague artists. While Leon De Smet was an intimist painter who in his typical style portrayed the world of the home and of house interiors and their stylish female inhabitants, Kitslaar became the painter of the beauty and splendour of flowers, of children and of nature and of the rural and pastoral scenery. He also developed his talent as a painter and draftsman of striking portraits, but his love for nature became stronger than ever and he more often replaced oil paint by pastel which he uses almost as a paste to model impressive macro views of flowers and plants. One needs to see the painter at work in his luminous studio to fully understand the virtuosity of his technique in the use of his pastels. Kitslaar starts with raw and vague contours and accentuated streaks to result in a luminous painting with an extremely fine touch. It is this subtle use of light and the play of the luminosity, combined with an unrivalled maturity in the use of various painting techniques, which gives his work an always-recognizable character. In the nineteen sixties he ‘flirted’ with the palette knife, but today he very meticulously brushes his loved subjects and everything which moves him onto the willing canvas. Hans Kitslaar built his career through trial and error and through blessings and bruises. Through the love and support of his environment he always found peace and reason and the force to grow, and the people he loves and who love him also gave him the strength to face the more difficult and sombre moments in his career. The combination of love and light gave him the force to fully develop and use his talent which he always administered with the care of a prudent and caring man. The use of light and tonality became his trademark. He uses the pastels as a master and became more generous with the paint. His tender pastel colours grew deeper with every landscape and portrait and give the work even more depth. On canvas he varies a generous with a parsimonious use of the paint, and he makes use of the structure of the canvas linen to add a third dimension. Through the use of very thin transparent he more than ever lets the light play the major role in a lyrically approached and at the same time almost mathematical composition. The more stringent design of the early years gradually faded away and matured into an almost lyrical externalisation of the daily rural life, of moving arrangements of flowers and of a moving portraying of common people. In the last years Kitslaar prefers the detailed study of flowers in all their magnificence and beauty. 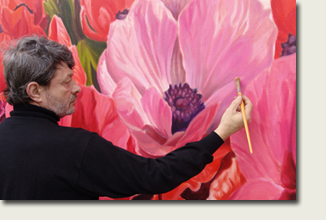 His ‘macro vision’ on flowers such as the iris or the snapdragon or the poppy are both a hyper realistic approach of his preferred theme as well as a lyrical-abstract landscape in itself. The critical observer can see both the flower in all its detail as well as the nearly abstract composition of colours and shapes. Behind the pastels and oil paintings of Hans Kitslaar one will always, under the touch of the painter, recognize the skill of a subtle draftsman. The artist who masters the art of drawing will not fail as a painter. The work of a genius painter such as Picasso reveals the genius draftsman behind the painter. When a painter fully masters the academic competences and has transformed these into his full and personal style, then the ‘oil’ of the painter rises to the surface so to speak and brings the full talent of the painter to its full expansion. Hans Kitslaar is a man of feeling, an emotional person and restless searcher who in his work always is in search of the ultimate theme and the most subtle expression. A search for eternity in an always-renovated approach.